GOWANUS — The Brooklyn neighborhood best known for a stinky canal will bubble over with creativity this summer when public art will be installed in at least three outdoor locations. The open-air art initiative will be funded by a $35,000 grant from City Councilman Brad Lander, who has teamed up with the Old Stone House and Arts Gowanus for the project. Artists have until March 2 to submit proposals, which can be in any media form. Organizers have selected three sites: the concrete plazas on either side of the Carroll Street bridge, the canalside esplanade outside Whole Foods, and Ennis Playground on 11th Street and Second Avenue. A fourth site could be added if an artist submits a compelling idea. The art will be displayed for 11 months starting in June, with a panel of judges selecting the winning proposals. Organizers are looking for artwork that "activates the space and makes people think about the space in a different way," Subak said. In addition to artistic merit, judges will select pieces based on whether the art relates directly to Gowanus. Organizers are inviting artists to get a crash course on the neighborhood's history and current events at a public meeting at the Old Stone House on Feb. 9. 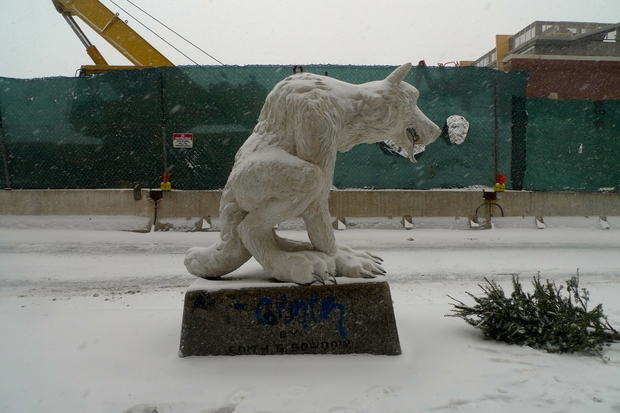 The public art idea was hatched during Lander's Bridging Gowanus neighborhood planning initiative, when art emerged as a top priority for locals, Subak said. Though Gowanus is full of artists, their output is mostly hidden away in studios. Street art decorates some blocks, and the nonprofit Groundswell has painted some murals, but public art projects have been few and far between. A floating sculpture docked in the canal in 2013, and an installation inspired by traffic lanes appeared on Fourth Avenue that same year. “To have a really publicly accessible place with art that's really for everybody, that's a new thing for Gowanus," Subak said. "Public art breaks down barriers between the official elite art world and everyday people. This is one way we make art for everybody and anybody." The community meeting about the public art project coming to Gowanus will be held Monday, Feb. 9, at the Old Stone House, 336 Third St., from 7 p.m. to 9 p.m.